20110126 - Up and at the desk all morning for some calls. Then got a good send off from L&G. Caught my flights to SFO and met up with Richard. We headed south to San Jose and met up with Steve for a huge steak dinner. 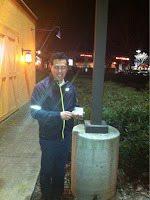 I introduced Richard to geocaching int the dark and think he's hooked. Off to the hotel.